I’m gonna say it once and for all: Blogs are not a medium for free advertising or pushing press releases. If this is what your sell to your clients as community management or blogger relations, you have to reconsider, and this is why. If you send a press release to a blogger every day, they have most likely spammed you by the third day. On the occasion that they haven’t, you would have probably just pissed them off. Shall I demonstrate? (I have been taking screenshots about this topic for a while to build up for this post). Not only are they spamming bloggers with their advertising, they don't have the decency to find the blogger's contact information themselves but keep harassing bloggers to send it to them. It's as if someone is asking you to shoot yourself in the face. Yes, they are sending me, a 23 year old guy from Beirut, a press release about press-on nails for a company based in Dubai. Complete with a 86MB video attachment. Not only that they don't even filter by country, gender, blog genre, they don't have the decency to address the person by name or blog. 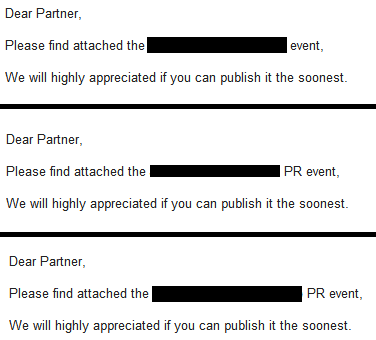 Why bother sending customized emails when you can bcc everyone and use "Dear Partner". If I am your partner, wouldn't I be entitled to a share of your profits? Or maybe some incentive? But no. Bloggers are free advertising media. They crave press releases and huge attachments. 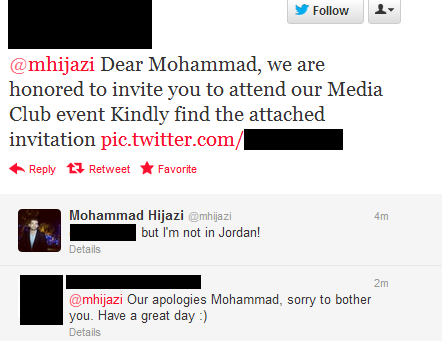 Not only that, they agree to post press releases about events that they did not invited the bloggers to. If you are going to bombard me about press releases of events, at least have the decency to send me an invitation so that I can decide whether your event is interesting and worthy of my blog reader's time. Talking about events, it's interesting how agencies tend to think that bloggers are lifeless creatures whose only task in life is to blog. If an agency ever invites bloggers to events, it's a mid-week event at 1:00pm. As if bloggers are not real people with real jobs. 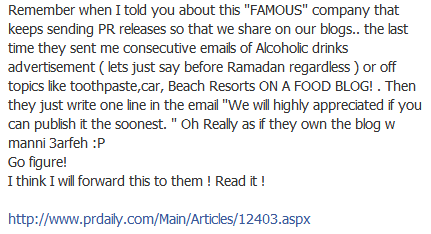 Another aspect agencies don't consider before sending out their lovely press releases is the demographic they are sending the press release to, such as sending alcohol related information right before or during Ramadan to Muslim bloggers (and any time for that matter would be offensive) or to minor bloggers. Furthermore, they don't even segment by location. Our agency is having a press event in Honolulu, let's send a press release about it to a blogger in Beirut. More irony about the event above is that I was invited several hours before the event actually happened. But how would they know anything about the blogger, his/her interests, age, location? It's not like they actually read the blog or have ever checked it out. 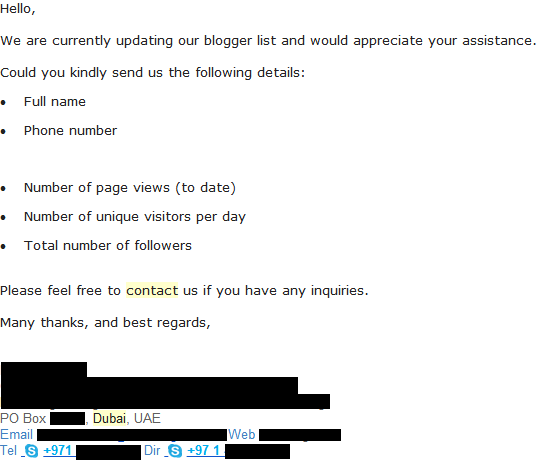 They just like to tell you that "We love your blog and our client is very interested in it". Instead, they have decency to ask for the blog stats instead of doing actual work. Imagine that! Needless to say, agencies really piss bloggers off. And I have left the best for last. They don't even monitor when bloggers are saying bad things about them. It's really a shame how some agencies have no respect to bloggers, especially in the age of social media. Instead of abusing them, they could have flourishing mutually beneficial relationships with them. Engage with one-on-one relationships with bloggers in your community. Build relationships rather than push press releases. Segment your emails and invites and send them only to the related demographic and not to all the bloggers. If by chance you want bloggers to publish material as is, consider giving them incentives or even paying for the post (the same way you pay for offline advertisements). Be personal with the bloggers, address them with their names, and make sure you prove to them in a way or another that you have read their post. Give bloggers prior notice of events. Do not invite them during the same day or a day before. Sometimes, bloggers might need favors or help or access to events etc... For all the things you expect from them, it is very advisable that you help them out and not ignore their emails. If you don't have time to read emails from them, how do you expect them to put up with your constant harassment? Harass bloggers about attending events that are during regular working hours or major holidays. Send bloggers press-releases about events they were not invited to. Scratch that. 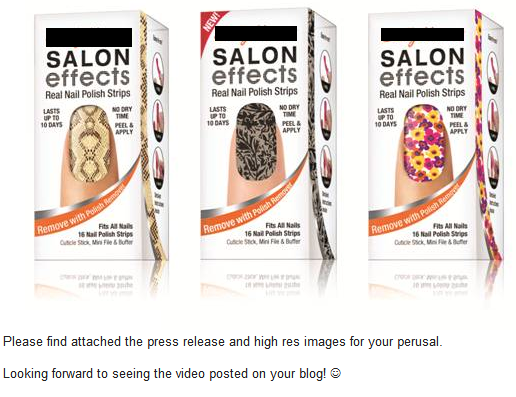 Don't send bloggers press releases at all! Not even if you disguise them as media kits. Send bloggers emails beginning with "Dear Partner", "Dear Friend", "To whom it may concern" or any related greeting. Ignore criticism about your agency or clients on blogs but rather embrace them and assure that you have read the complaint and are taking the issue into consideration. Keep sending emails to bloggers who have specifically asked to be removed from your contact list. Send annoying reminders. If a blogger didn't respond the first time, chances are they don't care and won't reply except negatively the second time. To make sure that one particular PR agency reads this post, we had to send them our own press release. If I really want to blog about a product, event or service I would ask for it!!! Because this will interest me more ! I love this post as it vents the frustration I've been noticing around me. It drives me absolutely nuts! Besides the lack of consideration by the agencies themselves thinking bloggers are just a tool for promotion or helping their clients, the bloggers themselves need to stop being sell-outs. If bloggers keep giving in to the perks of blogging and getting invited to events just because they are bloggers, maybe agencies would take them a bit more seriously and be more selective in their approach. Bloggers in the states earn money for promotional posts like this so in order for this to change, all bloggers need to put their foot down as you have done so well here. Bravo for voicing this here Mohammad! Great post and thank you for sharing it with me. I personally have heard bloggers complain about this at tweetups and it seems to fall on deaf ears. As for people actually reading the blogs before they contact you, I'm not sure how many of them do read your work before they spam you with info. I would like to think they do, but I guess your post has proof positive that it is not that case.